OLEDs are made from organic materials that emit light when electricity is applied through them. Since OLEDs do not require a backlight and filters (like LCD displays do), they are more efficient, simpler to make, and much thinner. OLEDs have a great picture quality - brilliant colors, fast response rate and a wide viewing angle. MP3 players are a type of digital audio player that fall under the broader category of PMDs (portable media devices). MP3 players became extremely popular upon their invention and commercialization more than a decade ago, partly due to their small and light form. AMOLED (Active-Matrix OLEDs) displays have been available since 2008. AMOLEDs can be made large, efficient and offer better resolution. One of the first players to have such a display was the 2008 iRiver SPINN. The flash-based player had a 3.2" touchscreen AMOLED display (480 x 372). In 2009, more companies introduced AMOLED displays in their MP3 players. Sony generated a considerable amount of hype with their X-series OLED Walkman. It had a 3" touchscreen AMOLED (432x240), Wi-Fi, and Sony claimed it was the best sounding walkman of all times. Cowon’s D3 Plenue was an Android (v2.1) running PMP with a 3.7" AMOLED display, Full-HD (1080p) support, Wi-Fi, HDMI out, Bluetooth and a T-DMB TV tuner. It had 8/16/32GB of onboard storage and a microSD slot. Smaller and cheaper MP3 players usually opt for PMOLED display. Such displays offer limited colors and graphics (some only offer monochrome displays and some offer just character displays), but are easier to produce and thus more affordable. One example was Sandisk’s Sansa Clip, a flash based player that was priced at only $40-$60. It had a 2 color, 4 line 1.1" OLED display and boasts FM radio, voice recording capability, and a 15-hour battery. 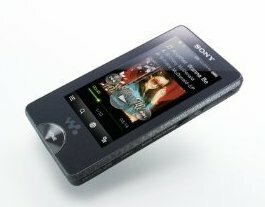 Another MP3 player with a PMOLED display was Sony's 2006 NW-S700F walkman. This was another small flash based MP3 player that offered 4 GB of storage, 50 hours of battery life, line-in recording and an FM tuner. Back in 2006 Sony said this is the best sounding Walkman ever (yes, also), and it featured noise canceling technology, and comes bundled with professional-quality headphones.